Why count the sheep ? when you can count on Simple Threads ..? 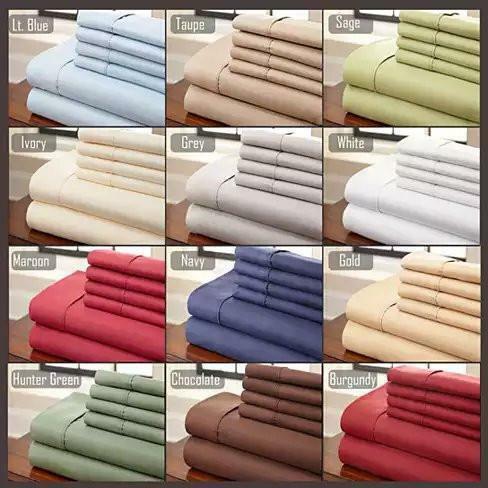 This 6 pc Set Super Cool Microfiber Bed Sheets Solid Colors 1800 TC Cool Bed Sheets in Plain Simple Solid Colors is all you need for a good night sleep..! 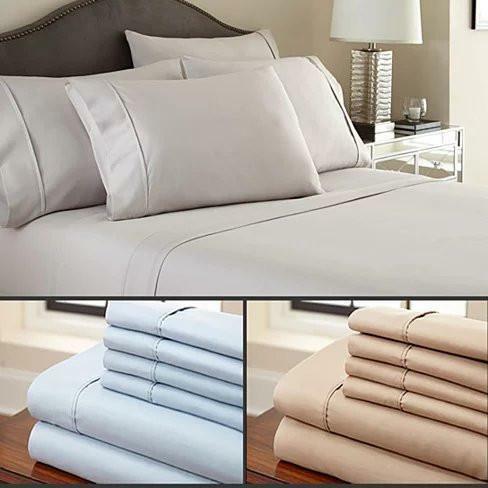 Sleep Calm and Dream On with these sleep inducing, extra soft and wrinkle free deep pocketed sheets, they are all yours now.. Dive into the cool comfort of your own bed and fall asleep restfully instantly.. We all know the fact that when our body gets rest , our mind works best.. Buy the peace of mind today and catch more ZZZs..! Details: Queen: 60” x 80” fitted sheet, 90” x 102’’ flat sheet, 20’‘ x 30’’ pillowcases King: 78” x 80” fitted sheet, 102” x 108’’ flat sheet, 20’‘ x 40’’ pillowcases The 6 PC SET INCLUDES: 4 - Pillow Cases 1 - Fitted sheet and 1 - 16 inch sheet to fit 18 inches to 20 inches mattress. 1800 THREAD COUNT 90 G S M (Grams Per Square Meter). The set comes in: Queen and King sizes. Solid Colors no Borders or embroidery on pillows. Machine Washable. Select from 12 colors to match your mood and decor.